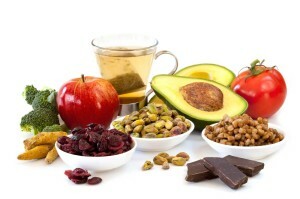 Foods for Gout | Antioxidant Rich Foods are BEST! The best foods for gout are antioxidant-rich foods. Many foods that are high in antioxidants are found in fresh fruits and vegetables and healthy fats and oils. There’s a common misconception about the best foods for gout that steers people away from the healthy fats found in animal products. This is unfortunate and needs to be resolved to achieve lasting gout relief and gout prevention. As explained by Dr. Thomas Cowan in this article from WestonAPrice.org, one of the most important nutrients that help to prevent the buildup of uric acid is vitamin A. 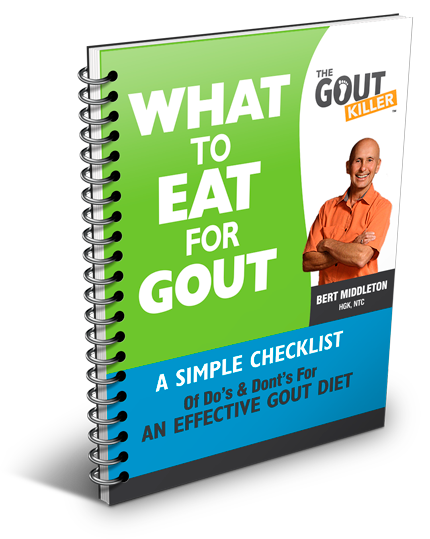 Raw whole milk, liver, and butter are some of the most beneficial foods for gout for this reason. 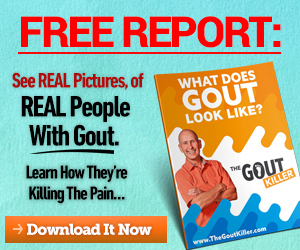 In preparing a comprehensive diet for gout, a guiding principle is to understand that some foods are alkaline-forming and others are acid-forming. Generally speaking, acid-forming foods can be one of the causes of gout, but to thrive and function properly, the human body needs both. Alkaline-forming foods are typically fresh fruits and vegetables, which coincidentally are also antioxidant-rich foods. Acid-forming foods are typically protein sources like various meats, and beans or legumes. The correct ratio between the two is 80/20 – 80 percent alkaline-forming foods and 20 percent acid-forming foods. Whether you’re looking in your shopping cart, inside your refrigerator, your cupboard, or the plate in front of you, roughly 80 percent should be fresh fruits and vegetables and 20 percent should be protein in the form of meats or beans. Make note, there is no mention of grains or bread/pasta products. Breads and pastas are technically processed foods, altered and packaged and therefore not easily digested. Acceptable grains are quinoa, brown rice and steel-cut oatmeal. While the direct cause of gout pain is the crystallization of uric acid in the joints, uric acid is not the cause of gout. Uric acid is an acidic substance that is the end-product of the metabolism of purines, and is valuable to the body as an antioxidant. Purines are made by the body itself at the cellular level and they are also part of the cell structure of all sources of food, plant or animal. The breakdown of purines creates uric acid and if the kidneys are not prepared, the body compromises by allowing the excess uric acid to crystallize in a joint, far from the vital organs it seeks to protect. Limiting purines is a logical way to manage gout; however it does not always work that well, especially if it is the only dietary guideline. 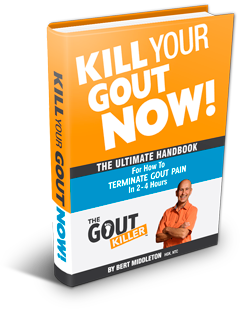 First and foremost, I am a big follower of the gout killer program. I cannot say I know all about it, but in general it has been life changing for me. I do greatly appreciated coming across the program. I do have one question though in particular prior to seeking additional information from my herbal health practitioner that perhaps you have the answer for. During a past gout attack (my second in my life) which prompted me to seek your experience I followed the special formula and within hours, pain gone, redness less, though redness continued for 2-3 days following and stiffness was ongoing. Air, Breathing, Water and for me drinking has been all resolved. A great diet being followed and on the way to being in the best shape of my life. #1 – how long does the stiffness usually continue for based on your experience? #2 – should you ever use the formula more than once? i.e.. if you felt an attack coming on, then immediately took the gout killing formula, what should your hourly or daily follow up be in regards to ACV/BS? I do know we have a one on one still out there and look forward to having that at some point bud. Fresh fruits like bananas, apples, peaches, pears and avocados are a good diet foundation. Frozen foods like cherries, raspberries and mangos are also great foods for gout. Salads from red or green leaf lettuce, kale, bell peppers, celery, carrots, beets, and broccoli are excellent vegetable choices. Dairy products are problematic. Commercial dairy is processed, pasteurized and homogenized. This effectively kills all the beneficial enzymes, nutrients and vitamins in dairy products, be they milk or cheeses. If you can seek out a local, safe source in your area for raw whole milk and cheeses, that is the ideal option. Studies have shown that dairy products help to decrease uric acid levels in the bloodstream. If raw dairy is not an option, purchase the most high-quality organic cultured dairy products you can like plain yogurts and kefir, and avoid pasteurized/homogenized products as much as possible. Beans and legumes can be a good option but have drawbacks for gout sufferers as well. Beans can be very high in protein and purines. The other concern is that unless you prepare and cook your own beans, they are processed and canned. This poses an inherent problem in the fact that canning adds toxic chemicals to the food – just one more acidic compound in the long list of foreign substances to be handled by the liver and kidneys. When eaten with careful regulation, different types of beans and legumes theoretically fit well on the list of good foods for gout. Pinto beans, garbanzos, lentils, split peas, kidney beans, black beans, and fava beans are all good sources of protein. Meats are relatively straight-forward. Excellent choices are grass-fed cuts of beef like filet mignon, free-range chicken, and wild-caught salmon. Organically-raised pork and goat meat are also good. The important thing when eating meat is to eat smaller portions (4 to 6oz), and only a few times per week. Below is a list of foods for gout that can easily serve as a shopping list to take with you to the grocery store. 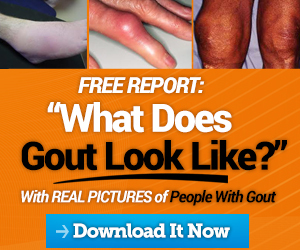 An important thing to make note of is that one of the causes of gout is simply that many people eat for “entertainment” in these modern times. Keep in mind while ordering menu selections at a restaurant, that restaurants are in business to make money — not to keep you healthy. Their goal, the same as any other business, is to cut costs and maximize profits, which means skillfully preparing the lowest quality food ingredients in a way that tastes fantastic and looks incredible. “Fantastic” tasting food and “incredible” looking food does not equate to proper nutrition. Proper nutrition is best obtained by shopping in the produce section and at the butcher counter of your grocery store, and buying as much that you can organically grown/raised, and then bringing it home and preparing it yourself. It is hard to understand but the most forgotten nutrient in the daily dietary intake of all people around the world is . . . water. Simply filtering tap water with a good carbon filtration system is all it takes to begin with. Drink half your body weight in ounces of water per day. The absolute best water to use for gout prevention is ionized alkaline water. In addition to high pH, it is also extremely antioxidant-rich and infinitely more readily absorbed into the cells. The antioxidant rich foods are the best foods for gout relief and they are ones that help to promote strong liver and kidney function.